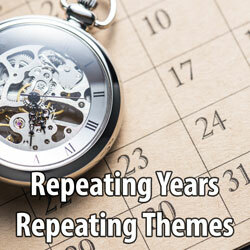 Annual profections is a timing technique that shows which life themes will be highlighted during each year of life, creating a 12-year repeating pattern that you can trace back in your life. This lecture will explain the basics of how this technique works, and then show what this repeating pattern looks like using a variety of example charts. The lecture also introduces what to look for in timing more specific events within a specific year related to that year’s main theme. This lecture was recorded on October 14, 2016 in Costa Mesa, California at a conference organized by the International Society for Astrological Research. A 71-minute audio lecture in MP3 format (33 MB digital download). A detailed 43 page PDF file containing all of the PowerPoint slides from the lecture. A helpful one-page handout with a quick summary of the years and respective themes. The price of the lecture is $15 USD. Just click the blue “buy now” button below in order to purchase it. You will be redirected to PayPal, and then once you are finished paying you will receive an email that will contain a link to download the files.